MY LOVE IS A ZOU-ZU. Tune- " My Love is a Sailor Boy." And my heart is a breaking because he's not here. In a young man bred a Zou-zu, only nineteen years old. His parents taught him to be a cavalier. And in Richmond, with Baxter, he'll be afore long.-Chorus. 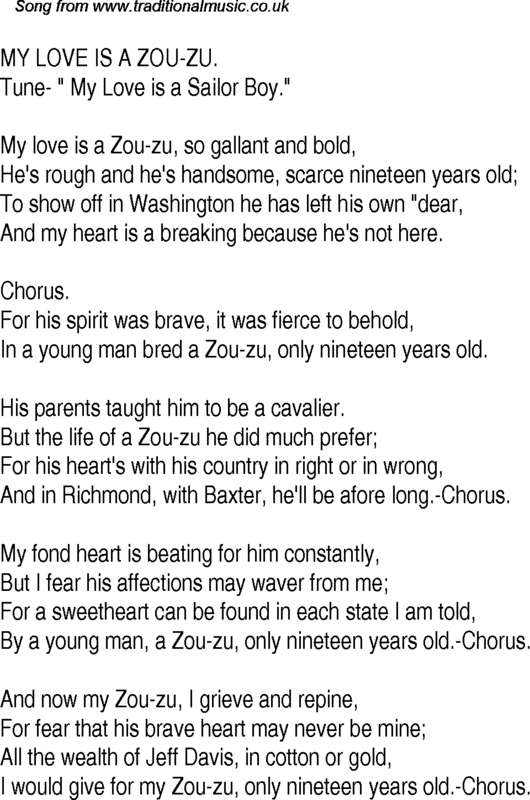 By a young man, a Zou-zu, only nineteen years old.-Chorus. I would give for my Zou-zu, only nineteen years old.-Chorus.